I'm a big Wes Anderson fan as you'll see in my reviews of his different movies. He has a rather peculiar style to filmmaking that maty seem weird at first but can be quite endearing and charming over time. And thus I've come to look forward to each new release. The announcement of Isle of Dogs rather surprised me because the last thing I had expected was that he'd return to stop-motion animation after Fantastic Mister Fox. Not that I felt Fox was a bad movie - in fact I loved it. But it just felt very different from his other projects and he had gone on to work on several live-action features after that movie. I was a little worried that this movie wouldn't get a local theatrical release given Anderson's movie's are a rather acquired taste. But despite a very limited release of 5 theaters in Metro Manila, Tobie and I managed to catch it on the first day. Let's face it - we were afraid that they'd pull the movie even before the weekend. We're that kind of a movie country, I guess. 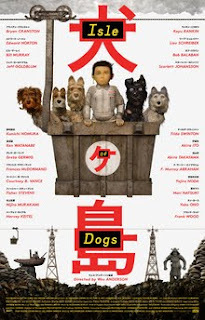 Synopsis: Isle of Dogs is a 2018 stop-motion animation movie written, produced, and directed by Wes Anderson. The movie opened the 68th Berlin International Film Festival where it won the Silver Bear for Best Director. In a somewhat dystopian near-future version of Japan, all the dogs in the city of Megasaki City have been banished to Trash Island because of a dog flu that has spread throughout the dog population. The very first exile was Spots, the official bodyguard dog of the young Atari Kobayashi (Koyu Rankin), adopted ward of Mayor Kobayashi (Kunichi Nomura). Anti-dog sentiment is at an all-time high and it seems the dogs are all being left to struggle for survival on their own on the desolate Trash Island. Some time later Atari manages to steal a small plane and crashes on Trash Island in order to find Spots. As the movie is mainly told from the perspective of the dogs, we meet the small pack of Chief (Bryan Cranston), Rex (Edward Norton), King (Bob Balaban), Boss (Bill Murray) and Duke (Jeff Goldblum) who find the "little pilot" and vaguely understand Atari's goal of finding Spots. But Mayor Kobayashi is determined to keep things quite as to have his ward standing up for the life of a dog would run counter to his anti-go election thrust. What I Liked: What didn't I like about this movie? There are so many great things that have me feeling like this is now my favorite Wes Anderson movie instead of The Darjeeling Limited. I keep telling friends this, but there's no other way to say it - this movie is beautiful. It's stop-motion animation with a crazy attention to detail in terms of all the different things they chose to animate in each scene but at the same time it has no intention of trying to appear realistic. You know it's stop-motion animation and it is a grand celebration of the art form as a way to enable some great storytelling. Again Wes Anderson has given us a crazy cast of characters and managed to still give most of them enough distinction for you to decide whether you like them or not. Whether it's Rex's devotion to the democratic process or how Duke always manages to hear a rumor about whatever it is they encounter while searching for Spots across Trash Island. And of course I love the Oracle (Tilda Swinton)! At the end of the day this is a well-told story about a boy who loves his dog enough to go find him and risk infection with a strange dog flu. And how that resolves could be said to be a little predictable but it's all so well done that you leave the theater quite satisfied. What Could Have Been Better: The human side of the storty beyond Atari is a little wobbly and the introduction of the foreign exchange student Tracy Walker (Greta Gerwig) was funny at first but in the long run a little odd. With all the attention on the events on Trash Island, the events at Megasaki City suffered to some degree, at least based on how things turned out. Some characters were built up a lot more in the trailers but got very little screen time in reality, which was kind of sad. As much as that was rather inevitable given the quest-nature of the whole structure. But still, there were so many dogs I wish we spent more time with. And I felt that Nutmeg (Scarlett Johansen) totally didn't get enough development to merit the ending that she got. She was intriguing but not all that fleshed out. And that was another waste. TL;DR: Isle of Dogs is still a beautiful, beautiful movie with a lot of heart in its story. It is a celebration of many things ranging from the production style to the characters and it nicely draws in viewers to celebrate as well. Thus the movie gets a strong 5 surprise twists in the big anti-dog plot out of a possible 5.